If there's one thing I love, it's a face mask. I've been using more and more sheet masks over the last year for a couple of reasons. Firstly, they do wonders for my skin and secondly, I like scaring Arran when I'm wearing one. 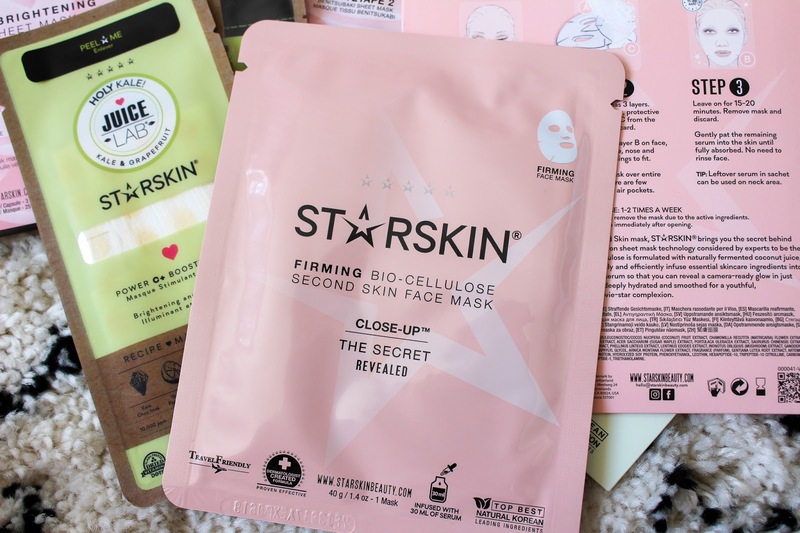 I'm a huge fan of Starskin face masks and I don't use much else, they just do the job so well and if you find something that works, why change that? Starskin are a multi award winning Korean - Swiss brand founded in 2015 by Nicole Arnoldussen and Paul Hendriks. Way before Korean beauty arrived in the West, their joint quest for the best in beauty led them to South Korea where they discovered more about the cutting-edge skincare science along with the secrets behind the latest natural, organic and botanical ingredients and so Starskin was born. 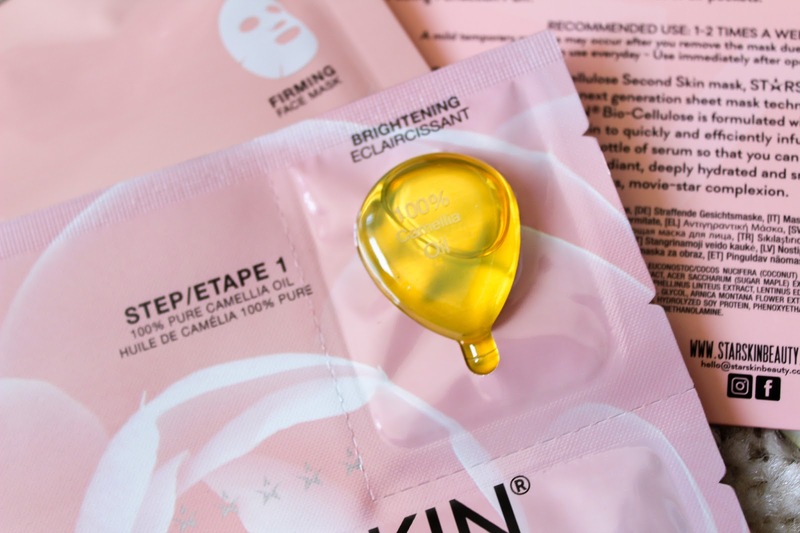 Starskin focus on delivering glowing skin in minutes using sheet masks. The unique formulations are infused with some of natures most potent super food. All formulations are free from parabens, phthalates, mineral oils, sulphates and synthetic dyes and all products are not tested on animals. 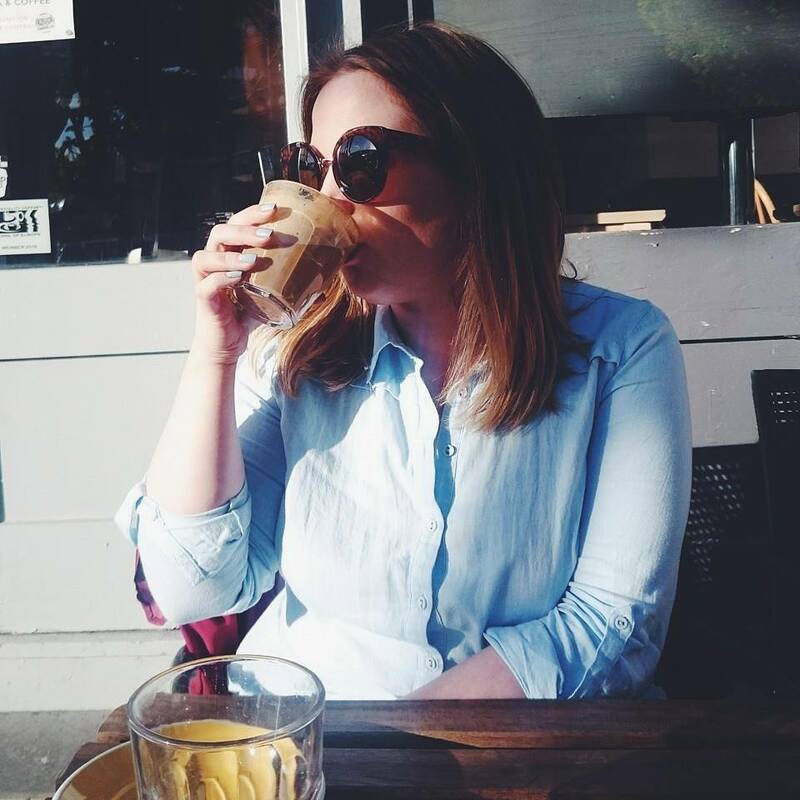 I've been trying out a few of their newest products including the Camellia masks and JuiceLab Booster mask and I couldn't help but include my all time fave, Close Up, a firming Bio-Cellulose second skin face mask. Close Up lifts and sculpts the skin for a supple, youthful appearance. The mask is soaked in 30ml of serum featuring a powerful complex of glacier extract, tripeptide 1 and vitamin rich coconut juice. This is my bubble bath mask because you need a good twenty minutes to allow it all to soak in. 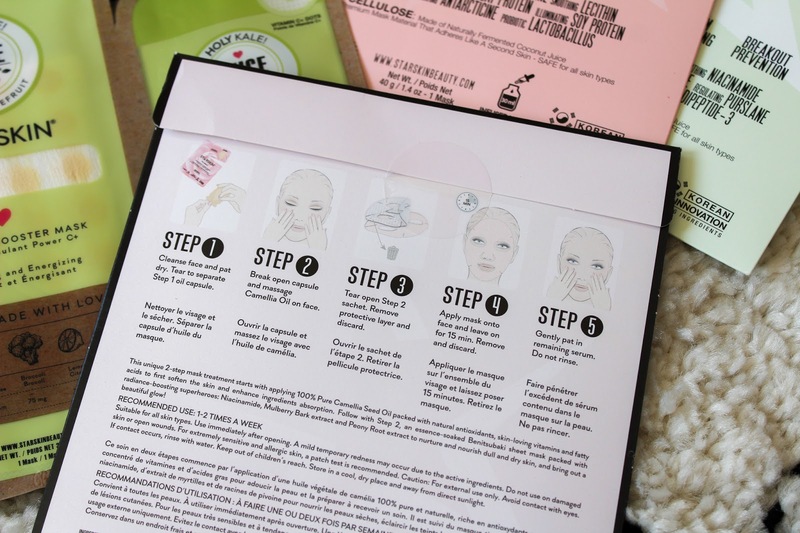 The results are really fab and I notice them after every use! JuiceLab booster masks are inspired by cold pressed juice bars and this particular one, Holy Kale, is packaged separately so you get to mix it yourself. Embedded with pure 75% vitamin c which delivers rejuvenated and glowing skin. Skin is left looking more youthful which is exactly what I need right now. I want to try Twist & Sprout next. 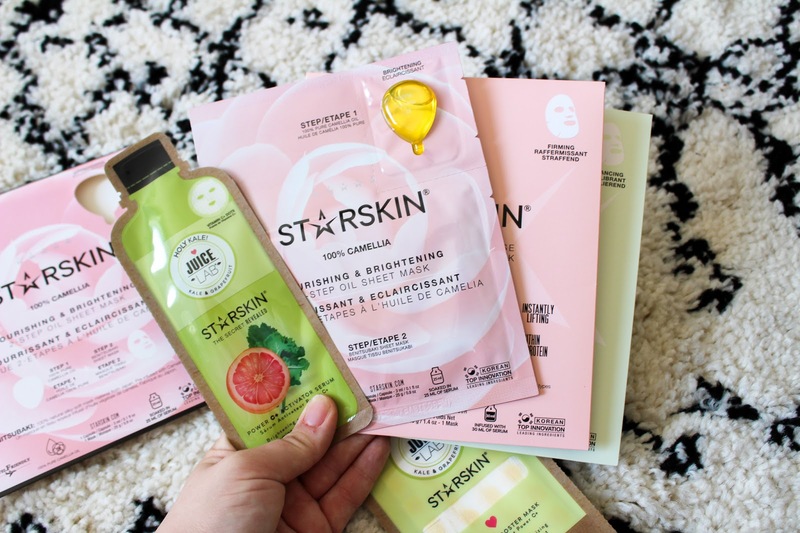 One of Starskin's latest product releases are the Camellia sheet masks. 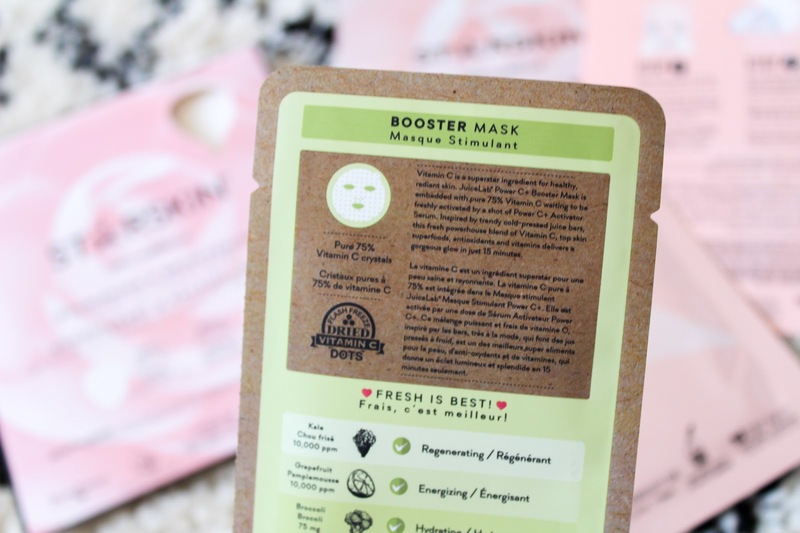 They're nourishing and brightening two step oil sheet masks and they leave your skin feeling incredible. Camellia seed oil has been used for hundreds of years and is the beauty secret of the Geishas. The unique two step mask features 100% cold pressed Camellia Japonica seed oil which you apply to skin followed by the soft sheet mask giving you double the moisture and double the radiance. The brightening mask is my personal favourite. You can buy Starskin online from Asos, Beauty Bay, Look Fantastic and Feel Unique. If you're unsure on what to choose, which is understandable as there is so much choice, you can pick up the gift sets to give some choice. Fabulous skin will soon be yours with Starskin. I love starskin! I had one mask when they first started buzzing around and fell in love. I especially love the multi part masks! I've never heard of this brand. defo need to check them out! They sounds amazing and I do love a face mask. I need to try more Korean beauty. I love the idea of the two step mask!